In the course of its average 20 months in circulation, U.S. currency gets whisked into ATMs, clutched, touched and traded perhaps thousands of times at coffee shops, convenience stores and newsstands. And every touch to every bill brings specks of dirt, food, germs or even drug residue. Research presented this weekend reinforced previous findings that 90 percent of paper money circulating in U.S. cities contains traces of cocaine. “When I was a young kid, my mom told me the dirtiest thing in the world is money,” said the researcher, Yuegang Zuo, professor of chemistry and biochemistry at the University of Massachusetts Dartmouth. “Mom is always right.” Scientists say the amount of cocaine found on bills is not enough to cause health risks. 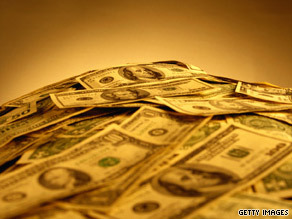 Money can be contaminated with cocaine during drug deals or if a user snorts with a bill. But not all bills are involved in drug use; they can get contaminated inside currency-counting machines at the bank. “When the machine gets contaminated, it transfers the cocaine to the other bank notes,” Zuo said. These bills have fewer remnants of cocaine. Some of the dollars in his experiment had .006 micrograms, which is several thousands of times smaller than a single grain of sand. Zuo, who spoke about his research at the national meeting of the American Chemical Society on Sunday, found that $5, $10, $20 and $50 bills were more likely to be positive for cocaine than $1 bills. “Probably $1 is a little too less to purchase cocaine,” Zuo said “I don’t know exactly [why]. It’s an educated guess.” For years, health agencies have advised people to wash their hands after touching cash for sanitary reasons. Disease-causing organisms such as staphylococcus aureus and pneumonia-causing bacteria have been detected in paper bills. According to a 2002 study published in the Southern Medical Journal, 94 percent of the tested bills had potentially disease-causing organisms. Adam Negrusz, an associate professor of forensic sciences at the University of Illinois at Chicago, said he isn’t worried about the cleanliness of money in terms of public health. “I never think about this as a source of danger. We have more things which can be potentially harmful,” said Negrusz, who was not involved in Zuo’s study. Cocaine binds to the green dye in money, he said. In 1998, Negrusz published similar findings after comparing freshly printed dollar bills that were not released to the public and money collected from a suburb near Chicago, Illinois. In the study, 92.8 percent of the bills from the public had traces of cocaine, but the uncirculated bills tested negative. Although the contaminated bills do not affect health, Negrusz said, they could cause in a false positive drug test if a person, such as a law enforcement officer or banker, handles contaminated currency repeatedly. “Imagine a bank teller who’s working with cash-counting machine in the basement of the bank,” Negrusz said. “Many of those bills, over 90 percent, are contaminated with cocaine. There is cocaine dust around the machines. These bank tellers breathe in cocaine. Cocaine gets into system, and you can test positive for cocaine. … That’s what’s behind this whole thing that triggered testing money for drugs.” Zuo hopes to compile the data from his research to form a drug use map, saying it could provide insights about regional cocaine use. In his study, the rate of drug-contaminated money varied geographically from urban to less populated areas. A hundred percent of the sample bills collected from major cities such as Miami, Florida; Boston, Massachusetts; and Detroit, Michigan, tested positive for cocaine, but samples collected from smaller cities such as Salt Lake City, Utah; Niagara Falls, New York;and Dearborn, Michigan, had 87 to 67 percent. Compared with currency from Brazil, Canada, China and Japan, U.S. bills had the highest percentage of cocaine, with 90 percent of 234 bank notes contaminated. Canada followed with 85 percent and Brazil with 80 percent. China and Japan had the lowest, with 20 and 12 percent respectively. “Actually, we were surprised to find cocaine in Chinese bank note,” Zuo said after analyzing 112 samples from China. After the Communist Party took over, the country was relatively free of drugs from 1949 until the 1980s because of harsh punishments against substance use, he said. Two years ago, Zuo collaborated with Beijing scientists on testing bank notes and didn’t find any contamination with cocaine. “In the last year, 2008, we found trace amounts of cocaine,” he said.